There are quite a few things I wish I would have known about before making the move to South Korea. Not only would they have made my life initially easier, they would have prepared me for the years to come. 1. Life is hard anywhere. This is number one for me. I can’t reiterate enough that if you plan on living overseas just to ‘get away from it all,’ you’re seriously mistaken. Sure you leave the craziness of American life, but being an expat has problems of it’s own. Friends come and go, and real, genuine relationships are hard to find. I go through bouts of loneliness, but thankfully I have a pretty stellar husband that offers to pose as ‘one of the girls’ if I ever needed a ‘girl’s night’ and had no one to go with. Important family and friend events are also missed while living abroad. Weddings, births, funerals…it’s heartbreaking knowing you can’t be there for someone. 2. I will never find pants or shoes that fit me here. This statement is followed by a big fat sigh. I was told once before we left that some clothes would be hard to find…I just wasn’t sure what exactly that meant. Looking back on it, I’m not sure I could have packed much more in my 4 military-grade duffle bags though. I think I would have left a lot more tops and coats at home. 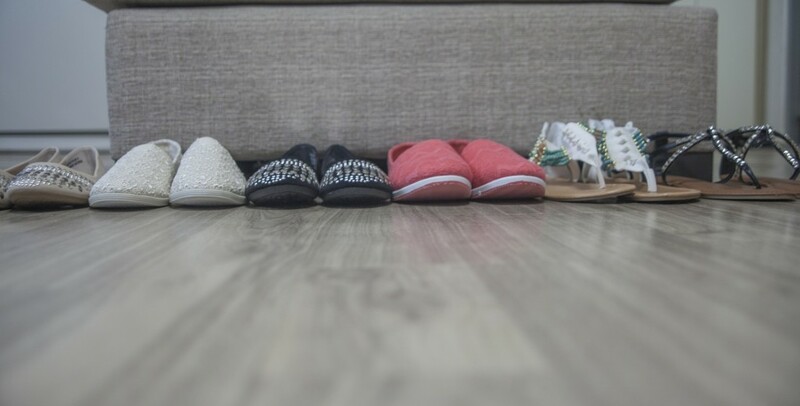 I also would have packed gobs of shoes. I don’t know what it is, maybe all the walking, but shoes wear out very quickly here. At the start of this year I had only 1-2 pairs left. Imagine my panic while I tried to figure out which of the two( hot pink nike tennies or sandals from Bali) I should wear with my ‘first day’ teaching attire. Thankfully my husband also recognized my plight, and gave me an online shopping spree at Urbanog.com. 3. Professional haircuts and dyes are brutal in South Korea. It’s no small secret that ‘foreigner’ hair and Korean hair are two different ballgames. Korean hair is naturally thick, straight, and sometimes a little coarse. Foreigner hair can vary: curly, straight, thick, thin, fine, course. Korean hairstylists go to beauty school to learn how to style Korean hair and not necessarily ALL hair types. I’ve had so many friends come back from the salon with totally butchered hair, including 2/3rds of it’s thickness cut out in layers. Ouch. This is why I refuse to go to a hair salon here. I’ve seen (and heard) of stylists in my town that studied in other countries, but I value my hair too much to risk a potential disaster. I’m happy to have my husband trim the ends every now and then. Dye jobs are also ridiculous here. I don’t know if they haven’t discovered toner here, or maybe they just like the canary yellow and slight orangish hue. I had a friend (who is a natural blonde) go in to a salon that was known for it’s foreigner friendly stylist (he was trained by Toni&Guy. She wanted a touch-up and a few highlights put in to her already lightened hair. A couple hundered dollars later she came out with orangish-blonde roots. It didn’t look terrible, it was just shocking due to the price and the fact that this guy should have been ‘professionally’ trained. 4. The seafood here is NOT the same as the seafood back home. Don’t let anyone fool you. If you go to a seafood restaurant here it won’t be ANYTHING like your seafood restaurant back home. 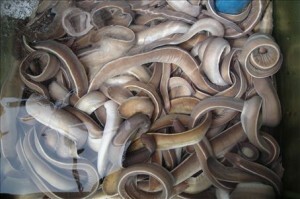 Eels, sea cucumbers, octopus, cuddle fish, oysters, and stingrays are all on the menu. Harder to be found are the beloved luxury items such as tuna, halibut, lobster, crab, tilapia, shrimp, and sea bass. Now all of a sudden I’m craving red lobsters cheese biscuits. 5. Learning Korean is a heck-of -a-lot harder than I thought. Last year my husband and I diligently went to Korean lessons for about a month, but then life happened. Go us. In that four week period we learned how to read and write the alphabet. We have since practiced our knowledge and can read pretty fast, even though we have no idea what the heck we are saying. We’ve also been able to pick up a few words or phrases from our students, and that’s helped us get the general gist of what people are talking about around us. It’s frustrating though, after a year and 6 months I would have thought my Korean would be better. This is why I started using Rosetta Stone. Crossing my fingers in hopes that it’ll work. 6. Kimchi will aways be terrible, no matter how long I’ve been here. I know people have different opinions on the subject…but Kimchi is terrible. It always has been, always will be. Kimchi is fermented (aka rotten) cabbage that’s been sitting in a big bucket several months. 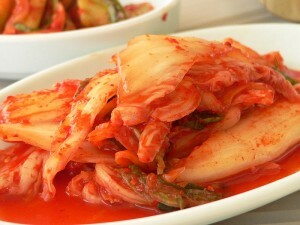 I once read a fact that each citizen of Korea eats 40 pounds of Kimchi a year. Maybe this is their secret to being skinny? They say if you keep trying kimchi every time you go out you’ll eventually like it. Well, I’ve been doing that since February of 2012, and my feelings towards it have remained the same. P.S I have an ANNOUNCEMENT to make! I’m paring up with four insanely fantastic bloggers: Patricia, Rachel, Beth, and Belinda, (basically my biggest blogger crushes) for a sweet GIVEAWAY coming to you tomorrow. What’s in it for you? Anyone and their mother can participate. Check back tomorrow and enter to win the whole lot!